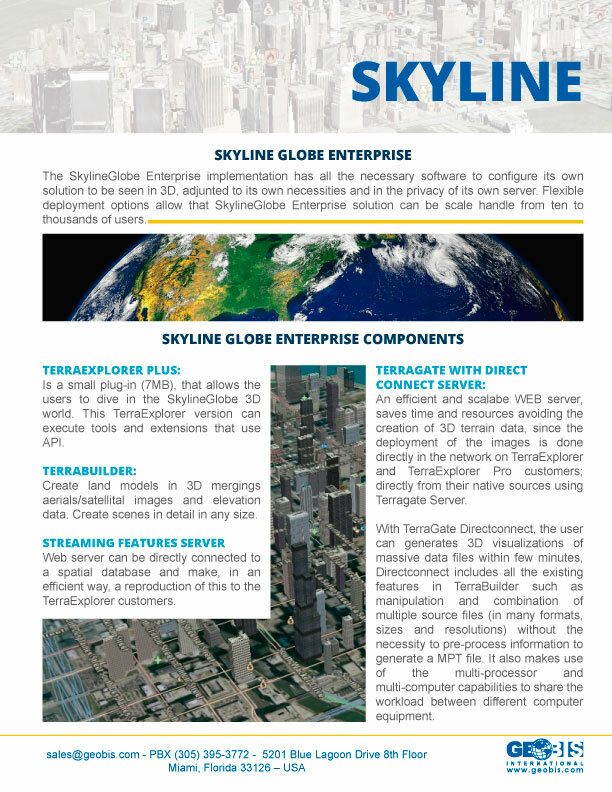 The SkylineGlobe Enterprise implementation has all the necessary software to configure its own solution to be seen in 3D, adjusted to its own necessities and in the privacy of its own server. Flexible deployment options allow that SkylineGlobe Enterprise solution can be scale handle from ten to thousands of users. 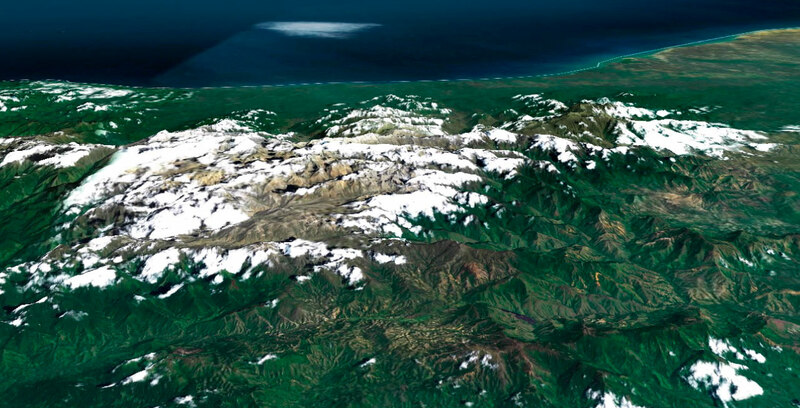 An efficient and scalable WEB server, saves time and resources avoiding the creation of 3D terrain data, since the deployment of the images is done directly in the network on TerraExplorer and TerraExplorer Pro customers; directly from their native sources using TerraGate Server. With TerraGate Directconnect, the user can generates 3D visualizations of massive data files within few minutes, Directconnect includes all the existing features in TerraBuilder such as manipulation and combination of multiple source files (in many formats, sizes and resolutions) without the necessity to pre-process information to generate a MPT file. It also makes use of the multi-processor and multi-computer capabilities to share the workload between different computer equipment. Contains the main SkylineGlobe 3D web sites and all the associated tools such as layers manager, drawing tool and measurement tool. EWP SkylineGlobe can be customized and expanded with additional tools developed by the customer. EWP SkylineGlobe is based on ASP.NET technology driven by the Oracle Express database (also compatible with MS SQL Server). A powerful platform with many features for 3D visualization, offers all the tools a professional needs to create geographic models and accurate, dynamic and expressive simulations. 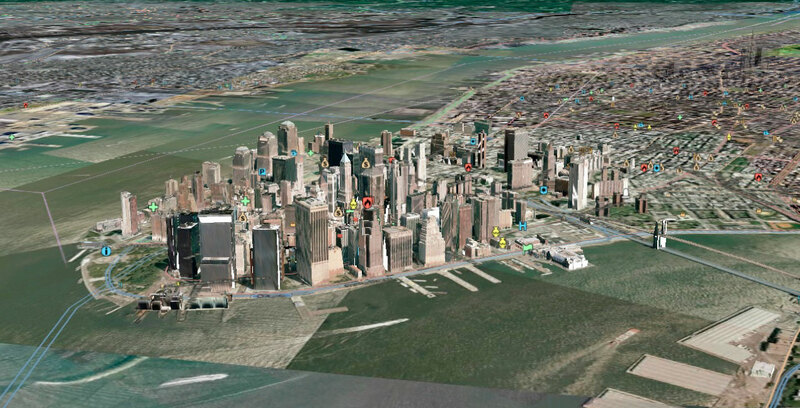 SkylineGlobe Pro includes the possibility to draw 3D objects, import and place 3D shapes onto 3D terrains, create static and dynamic routes for both objects in the environment and for the display and the ability to add images layers, elevation and advanced forms from different external sources. Allows sharing data in real-time and the collaboration between TerraGate users to create a common and real operational picture. Is a WEB aplicattion (Back-end) that allows the operator to control, monitor and customized various elements in the SkylineGlobe Enterprise operation. 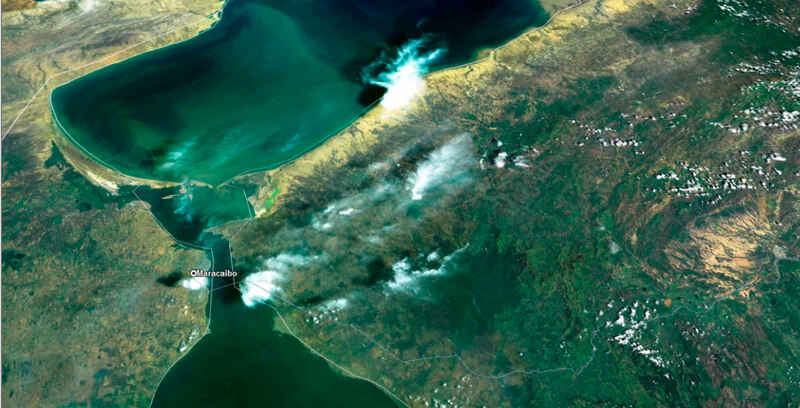 Web server can be directly connected to a spatial database and make, in an efficient way, a reproduction of this to the TerraExplorer customers. This application of business support is a viewer, analyzer, editor and assistant of the publication of multi-source ground models for both network environments to local environments. Includes a variety of edition tools that allows TerraExplorer Pro users modify or create new information layers to be share with established users. 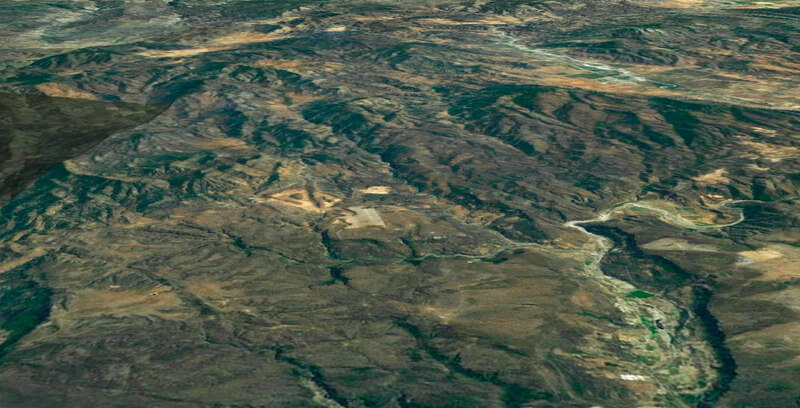 Create land models in 3D mergings aerials/satellital images and elevation data. Create scenes in detail in any size. Used with TerraExplorer Pro, provides Access to a powerful API for custom the user interface or integrate a 3D environment with WEB applications or for a single user. Is a collection of ActiveX controls that provide a complete customization of TerraExplorer Pro applications. 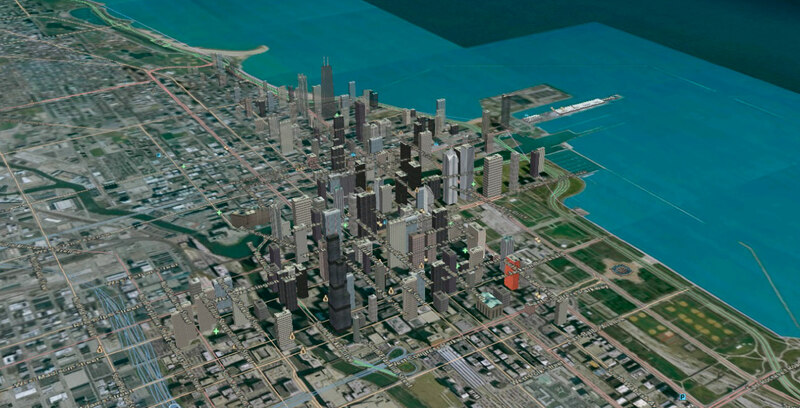 TerraDeveloper allows the inclusion of powerful 3D geospatial interfaces in any application for systems based on Windows. 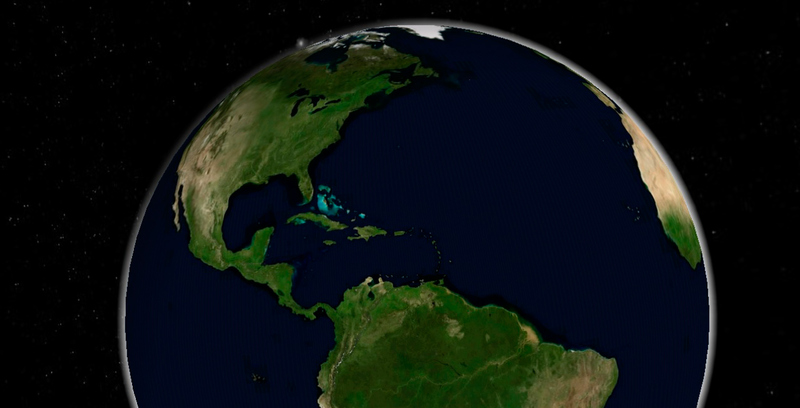 Is a small plug-in (7Mb), that allows the users to dive in the SkylineGlobe 3D world. This TerraExplorer version can execute tools and extensions that use API.